I have the following guitars for sale, click on the links for more images. If you’re interested or have questions send me an email claesgellerbrink@gmail.com or give me a call 639586158. If you see any other guitars on my blog that are not listed as for sale, it might still be worth getting in touch since I might consider selling. The Levin LT-16 if my favourite Levin shape and this is the late 1960’s Goya version with the large headstock and individual height adjustable saddles. These guitars are 38 cm wide just like a Martin 000, it’s a very nice size to play. Slightly smaller than a normal Dreadnought but with decent bass from the solid mahogany back and sides. The guitar has some wear but the neck is straight and fretboard and frets are fine. The original Van Gent machine heads are in good shape but the pickguard is a bit uneven from being badly glued in a previous life. Overall a great Levin guitar and very hard to find outside the US. You can read more about the guitar here and listen to it in this Youtube clip. A lovely little Swedish made parlour guitar. Rondo was made by Levin for Musik AB Westin & Co, a music store and publishing company in Stockholm with a large mail order business. It looks pretty similar to a Levin 119 and was made for both steel and nylon strings, this was pretty common on smaller Levin guitars in the 1950-60’s. It’s a very nice little guitar to play and it has more volume and sounds sweeter than expected, perhaps because it’s fan braced instead of ladder braced. This guitar can’t be compared to a cheap machine made guitar like Harmony, Silvertone or Framus. The action is a bit high but would easily come down with lighter strings. You can read more about the guitar here and listen to it in this Youtube clip. Fender Telecaster built in the old Fullerton factory in 1978. It’s an amazing guitar with a full C profile neck and beautiful wood grain showing through the natural finish. It’s all original and unmolested, nothing has been changed over 40 years. The finish has aged over the years so it has a bit of weather checking, small cracks in the lacquer, especially on the sides. The pickups sounds amazing, really twangy in the bridge and very warm and soulful in the neck position. It sounds and feels awesome. You can read more about the guitar here and listen to it in this Youtube clip. A great looking and sounding Japanese Telecaster, built by Matsumoko in Japan in the mid 1970’s. It’s built in the same factory that made the early Greco and all the Ibanez guitars and the quality and build feels exactly the same. Vorg was built by Pearl for the German market in the late 1970’s. It’s all original, except for the tuners that has been upgraded to Schallers, the Maxon pickups sounds really great. The neck is fantastic, really chunky for being a Japanese guitar. The previous owner has converted it to a string through guitar which makes it sound even better. The only damage it’s a small crack in the lacquer over the P in Pearl on the head stock. The white colour of the body has aged really nicely to a creamy colour. You can read more about the guitar here and listen to it in this Youtube clip. Made by Ibanez in the FujiGen facorty in Japan in the early 1980’s. Ibanez at this time produced Cimar, Antoria, CSL and numerous other brands. “CSL was a brand name managed by Charles Summerfield Ltd England, who imported Ibanez and CSL guitars into the UK from 1964 to 1987.” It’s a pretty solid Strat copy with the classic Ibanez Roadster headstock, used between 1979 – 1981 so I guess this CSL is from the first half of the 1980’s. The frets and fretboard is fine and the action low. You can see some more pictures here and listen to it in this Youtube clip. An awesome looking Gibson J-45 ADJ, built in the Kalamazoo factory in 1965. It’s the classic round shouldered Gibson dreadnought, natural finish spruce top, mahogany back and sides, rosewood fretboard and bridge. All original except for the refinish which turned this J-45 in to a J-50. Apparently this was done in the early 1970’s when the slight separation in the tops mid seam was glued. The guitar looks really great, worn but still well preserved for being 50 years old. The sound is just amazing, it has that typical Gibson bass response that you can hear on the early records of James Taylor and Jackson Browne. I cut a new bone saddle for it but it comes with it’s original adjustable rosewood bridge. It has an endpin jack already installed so it’s ready to play live, just ad a pickup. A brand new flight case is included to protect the guitar. The action is low and there are no structural issues with this guitar, just the normal marks and scratches. You can read more about the guitar here and listen to it in this Youtube clip. 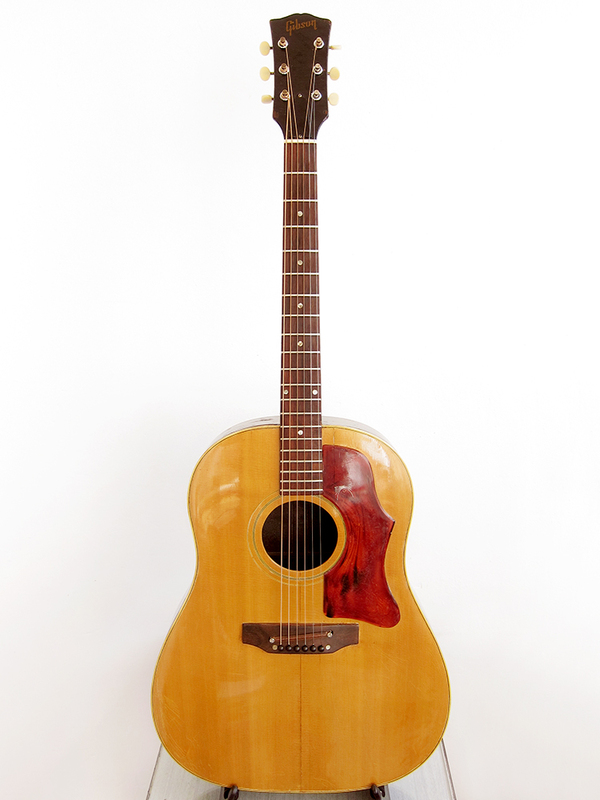 All original Gibson J-50 Deluxe, made at the Kalamazoo plant between 1970-72. The guitar is in very good shape for being 45 years old and had a professional neck reset about 15 years ago in Oklahoma, USA. The playability and sound of this guitar is amazing, great bass and very clean highs with ridiculously good sustain. It’s extremely lightly built for being a 1970’s Gibson and the neck profile feels like a Les Paul Custom. It has a few scratches and a couple of marks around the body but no cracks or structural problems. The only reason why I have decided to put this up for sale is because I want to get a 1970’s Martin D-28 or D-35 instead. The guitar comes with the original Gibson Deluxe machine heads and an non original hard case. You can read more about the guitar here and listen to it in this Youtube clip. This 1969 Gibson B-15 sounds and plays great and is pretty good shape for it’s age. There is a lot of scratches and wear to the top and sides but the are no cracks or structural issues. It’s all original and even comes with the Gibson made alligator chipboard case. The action is good and the frets has very little wear. The B-15 was an all solid model with a natural finished mahogany body, a mahogany stained spruce top and rosewood fretboard and bridge. Gibson referred to the B-series as student models at the time which is a bit misguiding considering what a student guitar sounds like today. These have great even tone and pretty amazing sustain for the size, a perfect little blues machine. You can read more about the guitar here and listen to it in this Youtube clip. Martin SPD-16R is a Special Edition Dreadnought from Martin guitars. Spruce top and Indian Rosewood back and sides with forward shifted scalloped X bracing. Performance taper, low oval mahogany neck with rosewood fretboard and bridge. Snowflake inlays, abalone rosette and a D-45 style back strip with gold Martin stamped machine heads. Produced in USA between 1996-2001. The guitar is in fantastic shape for being 18 years old with hardly any scratches and no fretware. The top has a hairline crack from the bridge down which has cracked the lacquer but not the wood. SPD-16R stands for Special edition, Dreadnought, 16-series in Rosewood. This guitar looks great and sounds amazing, you can read more about it here and listen to it in this Youtube clip. A beautiful all original over 100 years old Levin parlour guitar. Spruce top with ladder bracing, birch back and sides. Pyramid bridge, bone machine head buttons and real mother-of-pearl dot inlays. It’s in great shape for it’s age and sounds amazing for it’s size. Neck, fretboard and frets are fine but the action is little bit high, it could improve with lighter strings. You can read more about the guitar here and listen to it in this Youtube clip. 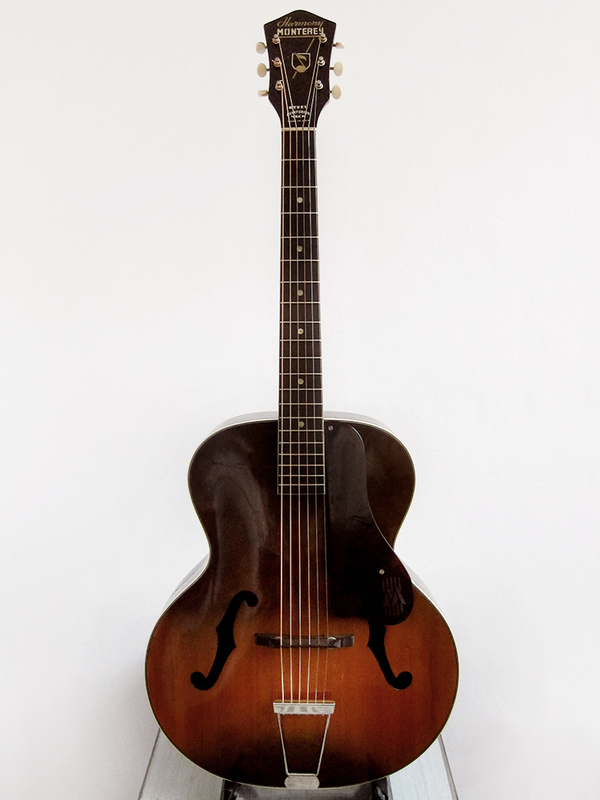 A really cool Levin archtop from the 1940’s. Hand carved Romanian spruce top with mahogany back and sides. The Levin archtops are loud and sounds almost as good as a Levin flat top guitar acoustically, you can’t compare this to any of the machine made archtops like Harmony, Silvertone or Framus. It has some damage to the side which has been glued and is now solid, but can be seen. It’s all original but has an Artec MHFC93-CR pickup installed so it’s ready to be taken out and gigged with. If you are looking for a worn old archtop that sounds amazing, well here it is. You can read more about the guitar here and listen to it in this Youtube clip. An extremely rare Levin guitar, I’ve never seen another. It’s the smallest of the 1960’s high end Levin guitars and is roughly like a Martin 00 in size. It’s an awesome guitar, pretty much like a Levin LT-16 but smaller and with a bit less bass but with more clarity in the upper register instead. It’s ladder braced instead of X-braced which gives it a perfect sound for finger picking. It has a beautiful alpine spruce top with a bit of bear claw and mahogany back and sides. The guitar is all original and incredible well-kept for being over 50-years old. You can read more about the guitar here and listen to it in this Youtube clip. A beautiful and very rare Levin, most likely the only one. Since they stopped making the Levin W-30 in 1975 I believe this to built by one of the guitar builders for himself outside of the normal production. The previous owner bought a lot of parts, material and finished guitars when the factory closed down in 1979, this was one of them. He claims that it was built in 1979, otherwise it wouldn’t have been around when the factory closed, which makes perfect sense. The original Levin W-30 came with block inlays while this has beautiful snowflake inlays in the bound ebony fingerboard instead. The alpine spruce top and the rosewood back and sides are bound with a five layer wood binding which looks really classy. It’s also treated with a thin layer of lacquer instead of the heavy clear coat that the mid 1970’s Levin W-30 came with. That gives a really open and beautiful sound, very Martin like. The guitar is in very good state but has some small marks around the body. The neck is in perfect condition and so is the frets. The spruce top has had a dry crack professionally repaired so it’s stable for another 40 years. These type of cracks are very common on Levin guitars because of the dry winters in Sweden. The guitar is equipped with an under saddle pickup and ready to play with live. This is a unique 40 years old hand built Swedish guitar for a third of what a vintage Martin would cost. You can read more about the guitar here and listen to it in this Youtube clip. In 1969 Levin replaced it’s flagship model the Levin LT-18 with the Levin Model 174, marketed in the UK as the Super Goliath Model 1855. The Levin Model 174 still had the characteristic bass side pearloid block inlays, ebony fretboard and bridge, alpine spruce top with flamed maple back and sides, but now came with the large headstock and individual height adjustable saddles. This example of the Levin Model 174 is quite unique since it has a dovetail neck-joint instead of the usual Levin bolt-on neck system. The guitar is in great shape and sounds amazing, really deep, warm and woody, like a good Levin dreadnought should. The original Van Gent machine heads has been replaced at some point and now it has Wilkinson WJ-309 in gold on, for that Art Deco look. Overall a great Levin guitar and very hard to find outside the US. You can read more about the guitar here and listen to it in this Youtube clip. The classic Levin LM-26 in it’s late 1960’s Goya version with the large headstock and individual height adjustable saddles. It has a nice sunburst alpine spruce top with solid flame maple back and side. The guitar has some wear and there is a glued crack in the top but the neck is straight and fretboard and frets are fine. The original Van Gent machine heads are in good shape but the pickguard has been replaced. The sound of this Levin is very Gibson like, think Gibson J-45 from the 1960-70’s. Overall a great Levin guitar and very hard to find outside the US. You can read more about the guitar here and listen to it in this Youtube clip. 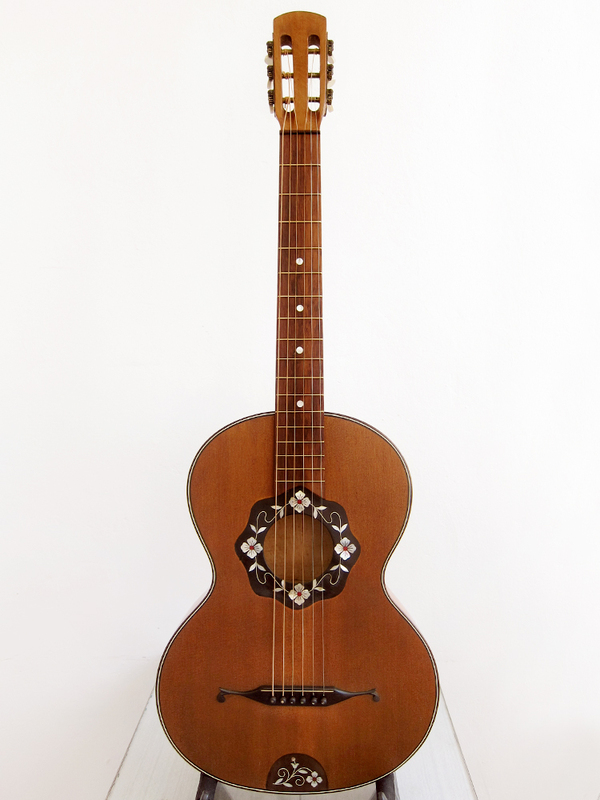 A typical folk guitar, fan braced and made for both nylon and steel string. It’s pretty worn but still very beautiful with it’s flamed birch back and spruce top. These type of guitars got really popular in the mid 1960’s during the folk boom in the US and Levin built quite a few under the Goya brand to compete with the Gibson F-25 and other Spanish guitar sized steel stringed folk guitars of the time. A great guitar for finger picking and very fun to play. It had a recent neck reset so the action is low. You can read more about the guitar here and listen to it in this Youtube clip. This is a beautiful Levin Model 13 Ambassadör, hand built in Gothenburg Sweden in 1950. If you are not familiar with this classic Swedish brand Levin, click on the link to read more about it. It was restored a few years ago by GammelGura, a great luthier in Örnsköldsvik, Sweden. With new bronze frets, a neck re-set, cracks glued and a new bridge was created to improve the intonation, the rest is all original. It even has the sticker on the back of the head from the guitar shop in Örnsköldsvik where the guitar was bought 65 years ago. It’s a fairly small ladder braced 12-fret guitar with a big sound because of the body width, 400 mm. All solid woods, as always with Levin. Spruce top, walnut back and sides, 4-ply bound top, single-bound back. Mahogany neck with non-adjustable T-shaped duraluminum truss rod. Single-bound rosewood fingerboard with 18 frets and pearloid dot inlay. Single-bound headstock, rosewood bridge, nickel plated individual tuners. Sunburst finish, very similar to the Gibson sunburst of the 1940-50’s, and 10 years warranty. You can read more about the guitar here and listen to it in this Youtube clip. 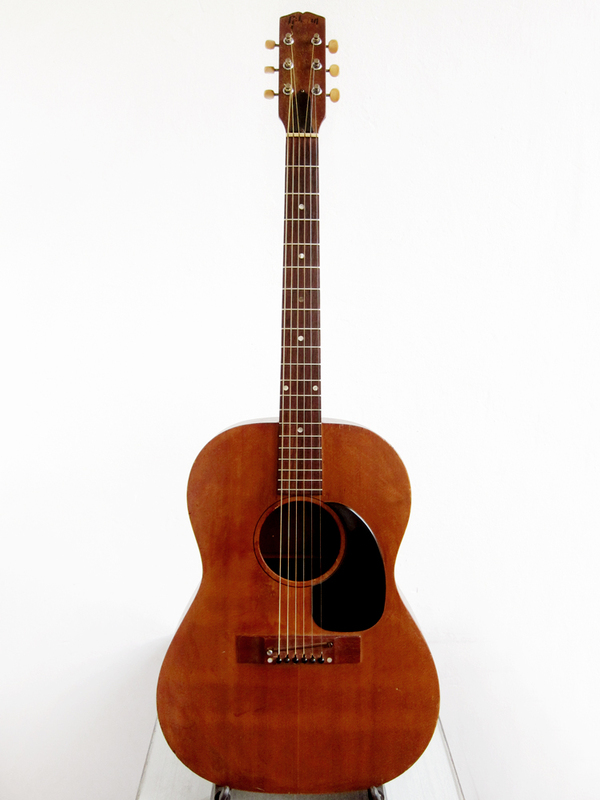 A nice little parlour guitar from Levin, made during World War II in Gothenburg Sweden. It’s just 315 mm wide so it’s a perfect little ladder braced blues machine. All solid woods, spruce top, birch back and sides with walnut fretboard, brass machine heads and nickel plated tailpiece. The guitar is all original, I carved a new bridge for lowering the action but the original will be included in the sale. The neck is really fat and nice and feels great to play. A perfect parlour for blues picking.You can read more about the guitar here and listen to it in this Youtube clip. A very rare Hagström Western 6 Missouri made in 1978 by Bjärton in Bjärnum in the south of Sweden. Bjärton were the second largest guitar manufacturers in Sweden after Levin, and they produced all the acoustic instruments for Hagström. It’s both stunning to look at, a joy to play and it sounds great. It has the same head, fretboard and inlays as the legendary Hagström Suede electric guitars had in the 1970’s. Spruce top with X-bracing, mahogany back and sides. 4-ply bound top and bound back. Unbound ebony fingerboard, rosewood bridge, mahogany neck. Matte natural finish and 10 year warranty, which was only give to the top end models. You can read more about the guitar here and listen to it in this Youtube clip. 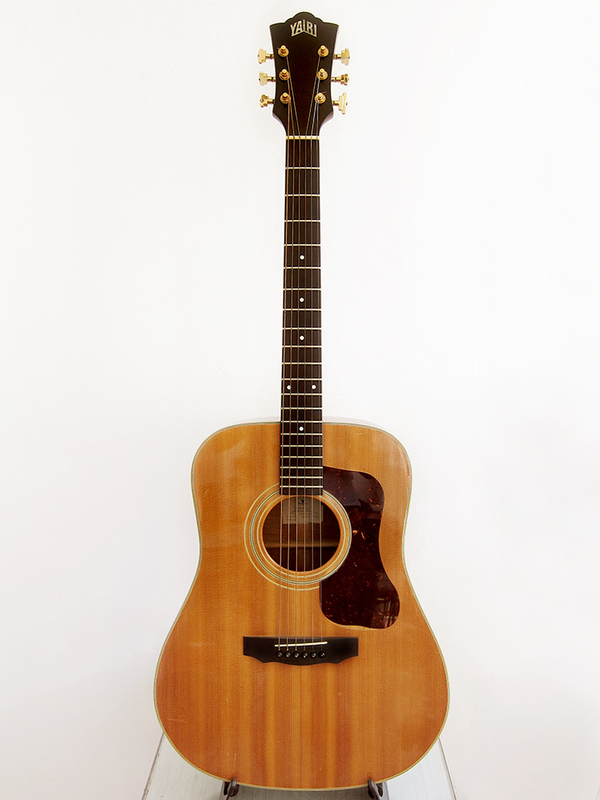 This great looking Gibson J-50 copy was made in 1975 by Bjärton in Bjärnum in the south of Sweden. Bjärton were the second largest guitar manufacturers in Sweden after Levin, and they produced all the acoustic instruments for Hagström. It’s made out of all solid woods and it’s a very nice sounding guitar, even though it has a bolt-on neck, I guess the solid woods and massive neck block is helping with the sound. Spruce top with X-bracing, mahogany back and sides with a nice mahogany bolt-on neck, unbound rosewood fingerboard, Single-bound top and back, rosewood pin bridge. Van Gent machine heads, just like Levin, natural finish and 10 year warranty, which was only give to the top end models. You can read more about the guitar here and listen to it in this Youtube clip. Very cool looking US made archtop from the late 1950’s. Solid spruce top with birch back and sides, 16 1/2 in wide grand auditorium size, steel reinforced neck. This guitar is all original and even comes with the original case. There is a glued crack on the side but no other issues. It sounds great, loud and clear acoustically. You can read more about the guitar here and listen to it in this Youtube clip. Harmony H-162 Grand Concert sized acoustic guitar, built in Chicago, USA in the late 1960’s. Built with all solid woods, back and sides of selected quality mahogany with a resonant spruce top. These were called folk guitars which is a grand concert size, the exact same size as a Martin 000. The only difference between a Harmony H-162 and Martin 000-18 from the time is the X-brazing and build quality on a Martin, they got the wood from the same mill in the 1960’s. It’s a surprisingly well sounding guitar for being a mass produced ladder braced guitar, way better sounding than any Gibson B-15 or B-25 I’ve heard. The soundhole, top and back edges are celluloid bound, which has cracked and been repaired in some places, very common on this type of binding after 40-50 years. The neck has been reset so the action is low, and it’s all original except for the machine heads and the trussrod cover. Straight steel reinforced neck with frets in great condition. The guitar has plenty of scratches and marks but no cracks, some discolouration on the side of the neck but nothing that you can feel while playing. 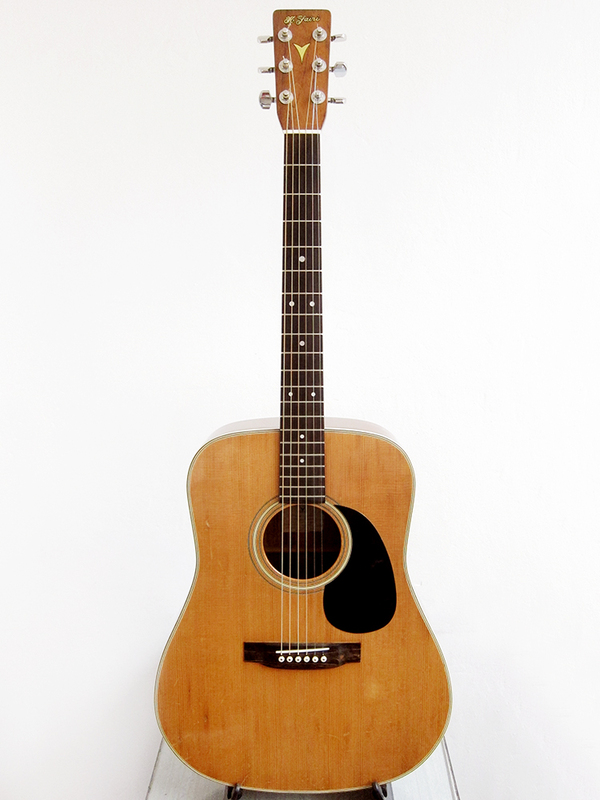 The Harmony H-162 was in production from 1940-1971, this one is most likely from the late 1960’s looking at the headstock. 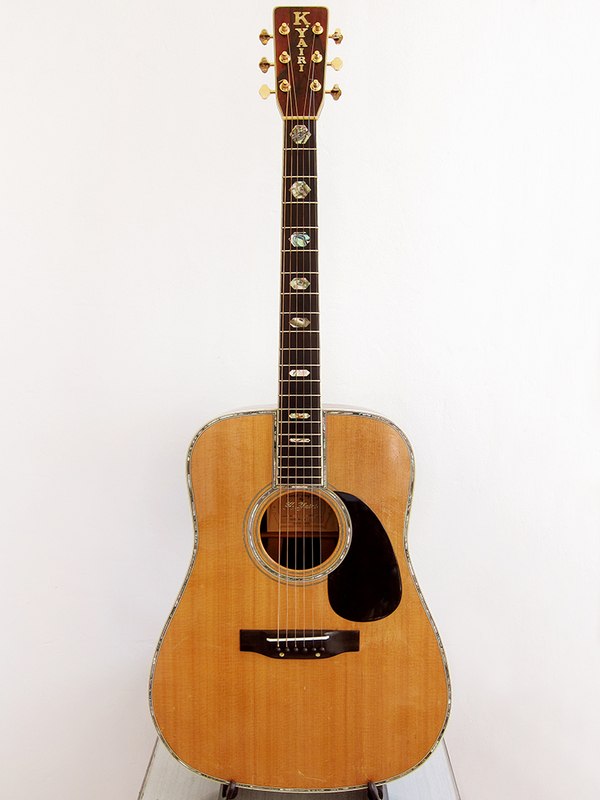 Considering the price of a late 1960’s Martin 000-18, or even a Gibson B-25, the Harmony H-162 is a bargain for a USA made all solid wood vintage guitar. You can read more about the guitar here and listen to it in this Youtube clip. Harmony H-162 Grand Concert sized acoustic guitar, built in Chicago, USA in the late 1960’s. Built with all solid woods, back and sides of selected quality mahogany with a resonant spruce top. These were called folk guitars which is a grand concert size, the exact same size as a Martin 000. The only difference between a Harmony H-162 and Martin 000-18 from the time is the X-brazing and build quality on a Martin, they got the wood from the same mill in the 1960’s. It’s a surprisingly well sounding guitar for being a mass produced ladder braced guitar, way better sounding than any Gibson B-15 or B-25 I’ve heard. The neck has been reset so the action is low, and it’s all original except for the machine heads and nut, the trussrod cover is missing. Straight steel reinforced neck with frets in great condition. The guitar has plenty of scratches and marks but no cracks, some discolouration on the side of the neck but nothing that you can feel while playing. 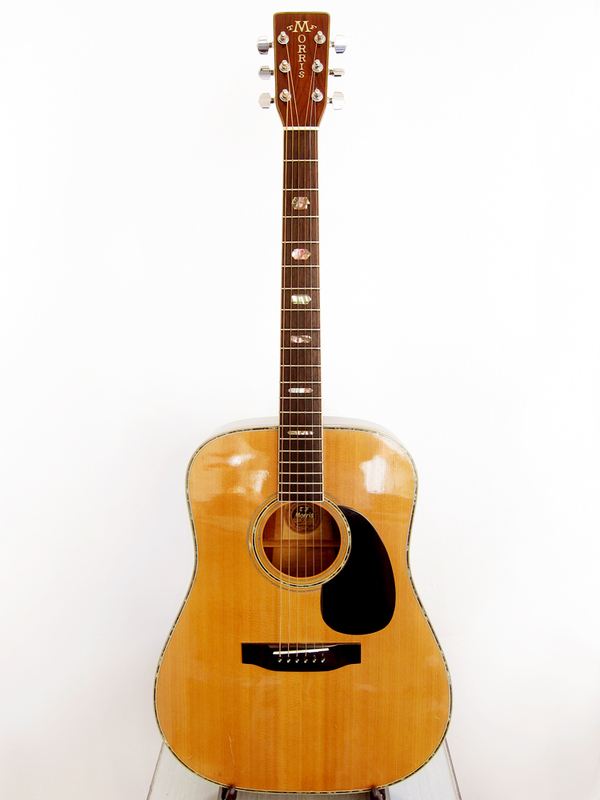 The Harmony H-162 was in production from 1940-1971, this one is most likely from the late 1960’s looking at the headstock. Considering the price of a late 1960’s Martin 000-18, or even a Gibson B-25, the Harmony H-162 is a bargain for a USA made all solid wood vintage guitar. You can read more about the guitar here and listen to it in this Youtube clip. Fender Telecaster built in the old Fullerton factory in 1979. It’s an amazing guitar with a chunky C profile neck and beautiful wood grain showing through the natural finish. The colour has aged over the years to almost a Butterscotch Blonde tone. I took this guitar apart and checked all the numbers and this one was made in 1979 even though the S8 headstock serial indicates 1978. The neck stamp says #2794 which means week 27, 1979, day 4, that was Thursday the 4th of July 1979. It has a few battle scars and the frets are a bit low. The volume pot has been changed but the rest seems to be all original. The pickups sounds amazing, really twangy in the bridge and very warm and soulful in the neck position. It sounds and feels awesome. You can read more about the guitar here and listen to it in this Youtube clip. 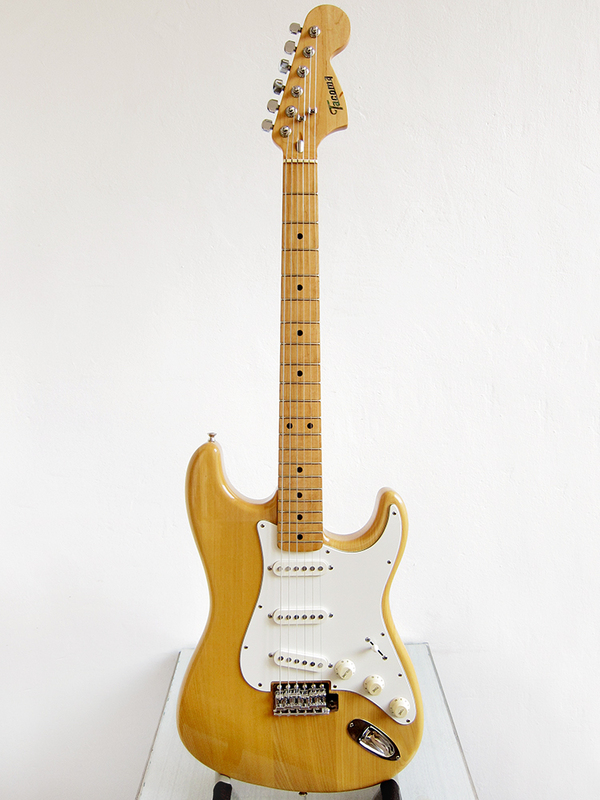 A late 1970’s hardtail Fender Stratocaster in a classic 3-tone sunburst. The neck is stamped with 1978 but body, pickguard and pickups says 1979, very common on late 1970’s Fender. All hardware is original but the volume pot and 5-way switch has been changed and the middle pickup is a bit of a mystery, neck and bridge are original Fender and stamped 1979. It’s in really good state for its age with just a few marks to the body, the grain is amazing and it looks like it’s a one piece ash body. The back of the neck is in great shape just like the original jumbo frets and fretboard. It sounds and feels awesome. You can read more about the guitar here and here and watch this Youtube clip. A fairly well kept Hagström HIII made by Hagström in Älvdalen, Sweden between 1970-1972. It’s the 491st HIII made in a series of totally 708 guitars, this was the last run ever of this model since it was replaced by the more 1970’s looking Hagström HII. When I bought this guitar it was in a fairly bad state so I did everything I could to bring it back to life and give her a second chance. She had a fretboard so worn that it seemed scalloped. I planned the fretboard, gave it a 10″ radius and re-fretted it with nice new Jescar frets and installed a bone nut. I took the whole guitar a part and cleaned all the hardware and put her back together again. One of the switches didn’t work so I replaced that, another switch seems to have been exchanged earlier, I also improved the grounding. The back of the neck was pretty worn so I filled all the dents with Nitro lacquer and sanded it smooth. The rest is all original, pickups, the Van Gent machine heads, tremolo and pickguard. It comes with what seems to be the original hardcase, or at least a period correct case. You can watch a video and read more about the guitar here. In mint condition, all original, without any doubts the best Telecaster I have ever played. Imported straight from Japan. The only reason for selling is because I prefer fat 70’s necks. There is no way to find the production year of these A-serial Telecaster with the serial number on the bridge plate. However, it must have been made between 1987 and 1989 since it’s a TL52-75. They were called TL52-70 between 1984-1986 and then changed to TL52-700 in 1990. You can read more about the guitar here and listen to it in this Youtube clip. Beautiful and in almost mint condition Greco TE-500N, made by FujiGen in October 1976. It’s a great 40 years old Fender ’72 Telecaster Thinline copy made in Japan for the price of a modern Mexican one. These guitars are extremely versatile, the humbuckers ads a lot of body and depth without being too muddy or dark, she still rings like a Telecaster should. Neck, frets and fretboard looks almost new and it has the most beautiful grain on the body. It’s all original except for the saddles and the switch. This is as close to a vintage Japan made Fender Telecaster you can get, built in the same FujiGen factory just before Fender gave the contract to build the first JV, Japan Vintage, series there. Greco is well known for their build quality and the sound of their Maxon pickups. This is an all original Greco TL-500, built in August 1979. The neck and frets are in great shape but there are some chips and marks around the body. You can read more about the guitar here and listen to it in this Youtube clip. This is as a great looking FujiGen built Greco Les Paul Custom copy with gold hardware. It’s all original and in great shape for it’s age. Greco is well known for their build quality and the sound of their Maxon pickups. The neck, fretboard and frets are in great shape and there is hardly any marks to the body. These Greco’s are of course set neck Les Paul copies and of way better quality then all the bolt-on neck guitars built by Matsumoku and other factories. You can read more about the guitar here. This is a beautiful looking Tokai Silver Star with great grain showing through the 3-tone sunburst. It’s all original and in really good state for its age with hardly any marks. Tokai together with Greco was without any doubt the best Japanese copies in the 1970-80’s and the reason why Fender started to produce guitars in Japan, first through FujiGen and later the Tōkai Gakki factory. It has great sustain and together with the legendary grey bobbin pickups it sounds amazing. You can read more about the guitar here and listen to it in this Youtube clip. A great Telecaster copy in a good shape for age but with some dings to the bottom of the body. Frets are in great condition and there isn’t a single mark on the back of the neck. It’s a pretty heavy Telecaster with great sustain and nice feel to it. The pickups sounds awesome and everything is working fine, all original except for the 3-way switch that wasn’t working properly so I replaced it with a new one. Really fast and smooth neck, lovely to play. A great sounding guitar with amazing sustain and great Japanese build quality. Made in Japan by Morris in the Moridaira factory, where H.S. Anderson made the Mad Cats that Prince uses. You can read more about the guitar here and here is a Youtube clip. This great looking Tacoma Stratocaster was made in Japan in the late 1970’s, most likely by FujiGen since it’s so similar to a Yamaha Super r’n Roller. It’s all original and in really good state for its age with hardly any marks. Neck, fretboard and frets are fine, it has great sustain and the pickups sounds great. You can read more about the guitar here and listen to it in this Youtube clip. It’s a bit of detective work left to do, I’m still not sure if these were made in the FujiGen or the Tokai factory. It’s most likely made in 1988, well if you can trust Guitar world crazy in Japan, but he seems to know his stuff. We can be pretty sure that the material is the following, both Guitar world crazy and Music-Trade Japan says the same. The RST-50 ’57 were made between 1981-90, came with Revival Logo, had a 3-piece alder body a Small head and a 1-piece maple neck, poly lacquer, L-5000 Vintage Arched PP Gray Bobbin pickups, separate Diecast & FSRG Press saddle. However, then it says that from 1984 the pickups changed to VS-2 and the saddle to non press marked which is weird since this one clearly has “Revival F.S.R.G” stamped on them. The frets are pretty worn, check the pictures, but it still sounds and plays amazingly. The back of the neck is in perfect condition, not a single mark. A lot of scratches to the front and some buckle rash to the back, check pictures. Saddles are rusted but the rest of the hardware shows little sign of wear. Everything works fine, the electronics are untouched and the guitar is all original except for the professionally fitted bone nut. Comes without a case and the tremolo arm is missing. These 80’s Fernandes tend to go for 400-800€ on eBay and the Japanese online guitar stores. I wrote a post about this guitar here. An amazing Stratocaster copy from 1979 made in Japan by Matsumoku. In really good shape for age but with some dings and scratches to the body. Frets are in great condition and there isn’t a single mark on the back of the neck. The wood in the body is amazing, without any doubt the heaviest and most solid Strat I have ever seen with fantastic sustain. Really nice tone in the pickups and everything is working fine, the original 3-way switch has been replaced with an Oak Grigsby 5-way switch. Really fast and smooth neck, lovely to play. A great sounding guitar with amazing sustain and great Japanese build quality.Here is some more info about the Westone brand. Here is a Youtube clip with the guitar. Nice Les Paul copy from the mid-1970’s made in Japan by Matsumoku. The body has a lovely grain and the guitar is in really good shape for the age. Frets show some wear but are still fine and everything is working perfectly. Really fast and smooth neck, lovely to play. The body is slightly thinner than a normal Les Paul, it feels more like a Melody maker or Junior. The humbuckers have a nice tone too them, not too heavy or muffled. A pretty versatile and nice guitar to play with great Japanese build quality. Here is some more info about the Westone brand. Here is a Youtube clip with the guitar. This is the first Japan made VOX guitar I’ve found in Spain. It’s a pretty decent copy of a 1958′ Les Paul with a great feeling fat neck and narrow head. The body has a lovely grain and the guitar is in pretty good shape for the age with a couple scratches and a few dents. Frets show some wear but are still fine and everything is working perfectly. The humbuckers have a nice tone too them, not too heavy or muffled. A pretty versatile and nice guitar to play with great Japanese build quality. You can read more about the guitar here and here is a Youtube clip. A great sounding C.G. Winner AO-410, a well built double cutaway neck trough guitar made in Japan. The brand was created by Clarence Griffith Winner (C.G.Winner), an American luthier and close friend of Leo Fender and built by Matsumoku in Japan, the same factory as Ibanez and Aria Pro II. These guitars are supposed to have Di Marzio humbuckers but I can’t see any markings on them so there might be normal Maxon pickups in this one. It has an awesome baseball bat neck, really fat and nice and plays really well. The hardware is a bit tarnished but it’s in overall really good shape for the age, the neck is straight and frets are fine. You can read more about the guitar here and watch this Youtube clip. Not the worlds greatest Telecaster copy but still a really cool and interesting guitar. Made by Teisco in Japan around 1965 for the Western markets. These were sold in Woolworths in the UK under names like Arbiter, Sonatone, Audition, Playsound, Kay and Top Twenty. In the US they were sold in Wallmart under names like Silvertone, Kent, Beltone, Duke, Encore, Heit Deluxe, Jedson, Kimberly, Kingston, Lyle, Norma, Tulio and World Teisco. It has one gold foil singlecoil pickup, these are worth more than the guitar itself and are favoured by guitarists like Ry Cooder for their special sound. It’s in really good state for the age and only has minor dings and scratches to the body. A cool guitar to add to your collection or to gig with, it might be the only Playsound guitar in Spain. For 250€ you also get the amp that originally came with the guitar. A beautiful late 1970’s Jazz bass made in Japan. The previous owner removed the logo on the headstock so there is no sure way of knowing the brand but it looks like a Matsumoku built instrument. Sounds and plays great. You can see some more pictures here and listen to it in this Youtube clip. This is a very well kept semi-hollow bodied Hagstrom Viking from 2008. It’s was built in China after the original Swedish specifications. I have played an original Viking from 1968 and they playability is way better on this one. The set neck is Canadian hard maple and the fretboard is made of Resinator™, a super hard material invented by Hagstrom to imitate an ebony fretboard but without dry spots and the negative impact on the envoirment. It’s amazingly easy to play with a fast smooth neck, as Hagstrom used the say back in the 1970’s “The fastest neck in the world”. A brand new Hagstrom Viking C-55 case is included, worth 100€. Here is a link to the Hagstrom site. Here is a Youtube review with a Hagstrom Viking from the same year. I bought this guitar in Stockholm in 2000 because of its beauty. I love the look of it but have always preferred my Telecasters so it hasn’t been played much. It’s in a very good state for being 14 years old with only minor marks, one small scratch on the side, see picture. The frets are still really good and the gold hasn’t worn off too much, it always does on these Epiphones. One intonation screw is missing for lower E on the bridge, but the intonation is really good and you can still move the saddle by hand. It’s really hard to find these old style bridges now, they are different on the modern ones, and the missing screw never bothered me. Overall, an amazing looking and great sounding guitar. Below are the modern specifications for the Epiphone Sheraton ll, hopefully it hasn’t changed too much in the past 14 years. Comes with original Epiphone hardcase. Like new, I bought it for my wife 10 years ago but she never learned to play so it has never really been used. It has one small dent in the bottom. You can see some more pictures here and listen to it in this Youtube clip. This is the top of the line, the fanciest guitar that K. Yairi built. Their Martin D-45 copies are legendary for their sound and build quality. This guitar has real Brazilian Rosewood back and sides and a beautifully aged solid spruce top. Real abalone inlays all around and the typical Martin volute where the head and neck meet. At the moment this guitar has Wilkinson WJ28NGD open gear machine heads in gold fitted but I still have the original K. Yairi machine heads. It’s all original except for the bridge which is a brand new hand cut and shaped replacement in ebony with a bone saddle and ebony bridge pins. The guitar is in great shape for being 43 years old but there are a couple of scratches to the top, one big one close to the bottom. The neck is straight, trussrod works and the action is low. The guitar sounds amazing, so deep and clear at the same time. These K. Yairi YW-1000 are extremely rare in Europe and without any doubt the closest you can get to a real 1970’s Martin D-45. You can read more about the guitar here and listen to it in this Youtube clip. A very rare and unique K. Yairi copy of the famous Guild D-40, which itself was introduced in the Sixties as a competitor to Gibson’s J-45. The Guild D-40 became famous as the Bluegrass guitar for their even response over all the strings and I have to say that this K. Yairi TG-40 sounds amazing. 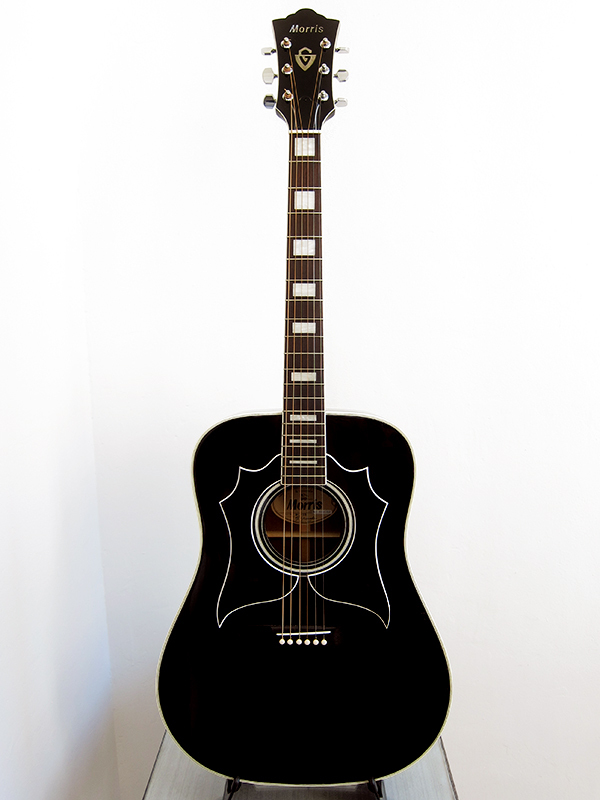 Solid spruce top, sides and back in solid mahogany, neck in Honduras mahogany, bridge and Fretboard in black ebony. The guitar is all original except for the pickguard, which was replaced with an official Guild pickguard, the old one was cracked. It has an end pin jack and strap button fitted and at the moment Wilkinson WJ-309 Art Deco machine heads in gold but I still have the original machine heads if chrome is preferred to gold. The top and back has a few scratches but no structural issues. It plays really well and has an amazing tone, very loud and clear with a great punch in the mid-range. You can read more about the guitar here and listen to it in this Youtube clip. Nice Martin D-42 copy with real abalone hexagon inlays and the typical Martin volute where the head and neck meet. Solid spruce top with nice inlays all around and a beautiful 3-piece back with flamed maple and dark rosewood. The guitar is all original and in really good shape for being over 35 years old but with some scratches, one slightly larger on the top. The neck is straight, trussrod works and the action is low. The guitar sounds great, very clear and Martin like. You can read more about the guitar here and listen to it in this Youtube clip. Great looking Martin D-42 copy with snowflake inlays and the typical Martin volute where the head and neck meet. Solid spruce top with nice inlays all around and a beautiful 3-piece back with flamed maple and dark rosewood. The guitar is all original and in really good shape for being over 35 years old but with scratches and marks around the body. It has Wilkinson WJ28NGD open gear machine heads in gold installed now but the original will be included. The neck is straight, trussrod works and the action is low. The guitar sounds great, very clear and Martin like. You can read more about the guitar here and listen to it in this Youtube clip. A pretty early Morris and a very nice looking Martin D-45 copy, made by Terada in Japan, the factory that makes Gretsch and Orville. Solid spruce top with a really nice 3-piece back of Brazilian rosewood and maple. The inlays are real abalone hexagon inlays and I still have the original machine heads if chrome is preferred to gold. It has it’s fair share of scratches and has been played a lot over the past 42 years but it has no cracks or issues. The neck is straight, trussrod works and the action is low. The sound is just amazing, really deep bass but with good clarity and great projection. It has a endpin jack fitted and a strap button so it’s ready to be gigged with straight away, just fit a pickup. It’s still one of my favourites but now I have too many Morris guitars and have to get rid of some. You can read more about the guitar here and listen to it in this Youtube clip. A really cool looking Johnny Cash Guild copy. It’s in great condition except for one flaw, the end pin has been pushed in at one point and cracked the lacquer. It’s not as bad as it sounds and it doesn’t really affect anything but I thought it would be worth mentioning. I’m pretty sure it’s mahogany back and sides, it has a really warm and nice sound and is a great playing guitar. It has a endpin jack fitted and a strap button so it’s ready to be gigged with straight away, just fit a pickup. You can read more about the guitar here and listen to it in this Youtube clip. This is a quite accurate Martin D-28 copy made in Japan by K. Yairi in 1977. It’s really light and beautiful sounding, very responsive and a joy to play. Solid spruce top, rosewood back and sides with a smooth ebony fretboard. It has it’s fair share of scratches and a couple of dents to the top but no cracks or issues. The neck is straight, trussrod works and the action is low. The sound is great, very clear with great harmonics. It has a strap button fitted and at the moment Wilkinson open back machine heads in gold but I still have the original machine heads if chrome is preferred to gold. You can read more about the guitar here and listen to it in this Youtube clip. Here is a really well kept Luxor 42-274, a beautiful looking Dove copy from the 1970’s made in the Matsumoku factory in Japan by Ibanez. Luxor was one of many brands that Ibanez produced during the 1970’s, every country had their own deal with Japan and Luxor was imported for the German market by Musikhaus Otto Manfred Hack in Göttingen. The guitar is really well built with great Ibanez quality and fells better than a lot of Matsumoku built acoustics that I’ve played. Frets and fretboard are fine, there are a couple of scratches but over all it’s in very good shape for the age and plays really well without any issues. You can read more about the guitar here and listen to it in this Youtube clip. A great looking Ibanez V 637 BS in tobacco sunburst. Built in 1978 by Fujigen Gakki in Japan. This are really solid and great sounding guitars with a huge fan base all over the world. It’s in very good shape for the age with just a few marks around the body. The neck is straight and the fretboard and frets are fine. It has a fresh bone saddle and nut installed and sounds great with good bass response and clear highs. You can read more about the guitar here and listen to it in this Youtube clip. Japan made Gibson J-50 copy in a pretty good state for it’s age. I couple of marks on the spruce top and few knocks on the head but structurally very sound without any cracks. This Maya F334G was made by Chushin Gakki in Kobe, Japan, during the 1970’s. It has a really fat neck, it’s feels great to play, adjustable bridge with both bone nut and saddle. The sound is very full with a great booming bass, you can listen to it here. If you want more pictures you can check the post I wrote about it. A nice Suzuki Violin Co. LTD, Suzuki Three-S F-120 built in Japan in 1976. It’s in really good shape with just a few scratches on the back and sides, nothing that stands out. The tone is great, very clear sounding and it’s really easy to play with low action and no buzzing. It seems to be solid spruce top, nato back and sides, with nato neck and rosewood fingerboard. It looks like it’s a Martin D-18 copy. The neck is straight, no marks on the back and everything works as it should. A well built Japanese acoustic from one of the most famous guitar makers. Here is a Youtube clip with the guitar. Made by Kurosawa guitar in the Matsumoku factory in Japan in the late 1960’s. This little X-braced 000-sized guitar is a joy to play and is great for finger picking with good bass response for it’s size. Really fat and nice neck and in a great overall condition. There is one mark on the back of the neck that has been filled and lacquered over and a couple of small marks here and there. This guitar is all original except for a newly fitted bone nut and saddle. Frets and fretboard are fine, it plays really well without any issues. You can read more about the guitar here and listen to it in this Youtube clip. Extremely well kept Kiso Suzuki Violin Co. LTD. WE-150 built in Japan in 1980. A few scratches on the top but it’s more or less unmarked. It sounds great, really easy to play with low action and no buzzing. The neck is straight and everything works as it should. A well built Japanese acoustic from one of the most famous guitar makers. Eko Ranger VI from the 1970’s, all original. Some cracks in the lacquer, dents and scratches to the body. Pickguard seems to have been ruined by the sun or maybe the previous owner re-glued it and used a glue that reacted with the plastic, Awesome neck, feels like a Les Paul and is without any doubt the easiest acoustic to play solos on. I have just refretted the guitar with brand new Nickel (12%) Silver medium frets so no fret wear. Typical bolt on neck tone, really cool. It seems like previous owner have made a bit of a mess when he re-glued the nut, please see the photos. I wrote a post about this guitar here. Really nice Martin D-18 copy by Hondo, made in Korea. Some scratches and dents to the body but nothing major, it’s in a pretty good state for being 30 years old. Seems to have bone nut and saddle. Grover machine heads in chrome. Holes made for an undersaddle piezo pickup but none fitted at the moment. Great warm tone and the guitar both looks and sounds amazing. I wrote a post about this guitar here. 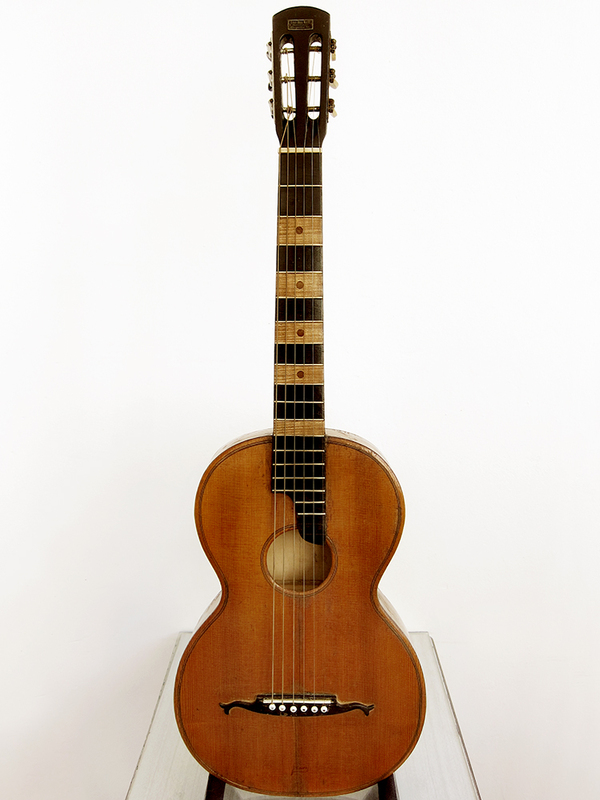 A very beautiful and perfectly playable old German parlour guitar. Straight neck, no cracks and all original with low action. Beautiful mother of pearl inlays around the sound hole. You can read more about the guitar here and listen to it in this Youtube clip. A beautiful looking little parlour guitar made by Sonora in Vogtland, one of the finest areas for guitar building in Germany. The guitar was just in parts and has been fully restored by me and is now playable again. It had a banana neck, like most steel string guitars without a trussrod, now the neck has been reset and straightened. It plays well with low action up to the 12th fret where the neck and body meets. The guitar looks amazing, with really nice patina and great tone. You can read the whole story and see more pictures in this post I wrote about it. This is a lovely sounding Spanish guitar and it’s very easy to play. It has an amazing patina and looks stunning, especially the fancy mother of pearl inlays around the soundhole. Pretty well kept for it’s age but of course it has numerous dings and marks around the body. It has an old crack on the side that has been glued in the past and seems very solid. The back of the neck is clean and the frets and fretboard is fine, except for a couple of groves in the fretboard around the 3rd fret that you can’t really feel. The action is fine for 50 year old guitar without a trussroad and there is no problem to play high up on the neck and it intonate well. Solid spruce top, mahogany neck and I think solid mahogany back and sides. If you want more pictures you can check the post I wrote about it. Nice sounding Spanish guitar, probably made around the 1960-70’s, in Mataró outside Barcelona. It’s pretty beat up and had a broken head, a cracked brace and loose back when I found it but now it’s fully restored and playable again. Solid spruce top, mahogany neck and I think solid maple back and sides. You can listen to it here. If you want more pictures you can check the post I wrote about it. Starts to get both a nice tone and colour after almost 10 years of use. Bought new in Sweden by me in 2004. Fitted with an Artec MSP-50 pickup that sounds pretty good even without a preamp. This has been my main acoustic for rehearsals and gigs, set with really low action and a nice fast neck. Great for all types of playing. I have never heard of the brand and can’t seem to find any information about it. If you want you can send me a photo of the label inside and I can try to track down the guitar, claesgellerbrink@gmail.com. My suggestion is to enjoy the guitar and play it as much as can. Hola, estaría interesado el la Levin Goya F-11. No estoy seguro si ed aquí donde debo contactar. Dejo mi mail. Un saludo.